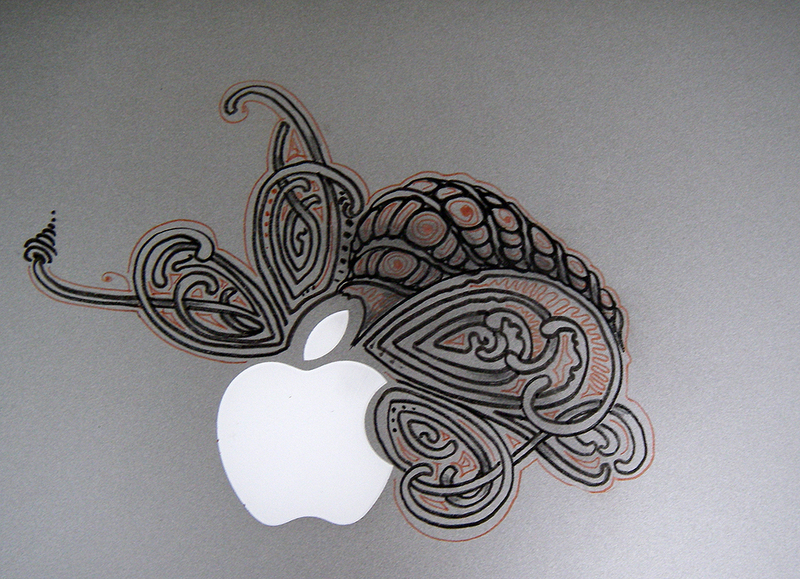 We've been busy with our Zentangle presentation at the GEL conference in NYC. We had such a great time we forgot to take pictures until the last minute. Here's a shot of folks checking out their mosaic at the end of our workshop. We mounted everyone's tiles for viewing at a get together afterward. 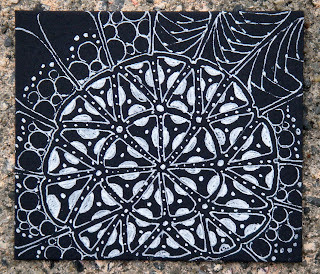 We used pins on canvas covered foamcore. We were one of three morning breakout sessions. The other two were juggling and theater improv. Attendees were encouraged to pick a session that was outside their comfort zone. 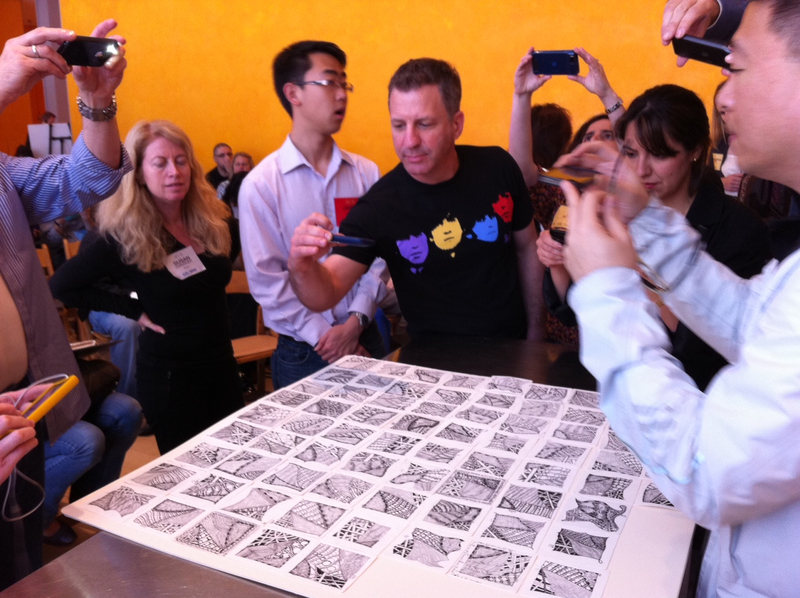 So we had lots of people attend who otherwise would not have chosen "drawing." 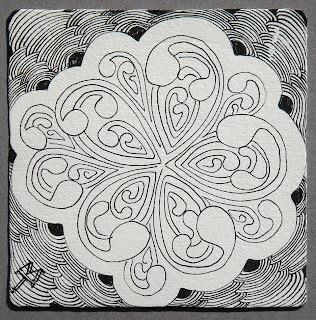 This turned out to be a great suggestion because we love presenting Zentangle to people who think they aren't artists or who reluctantly attend. The experience was wonderful for us and our attendees. 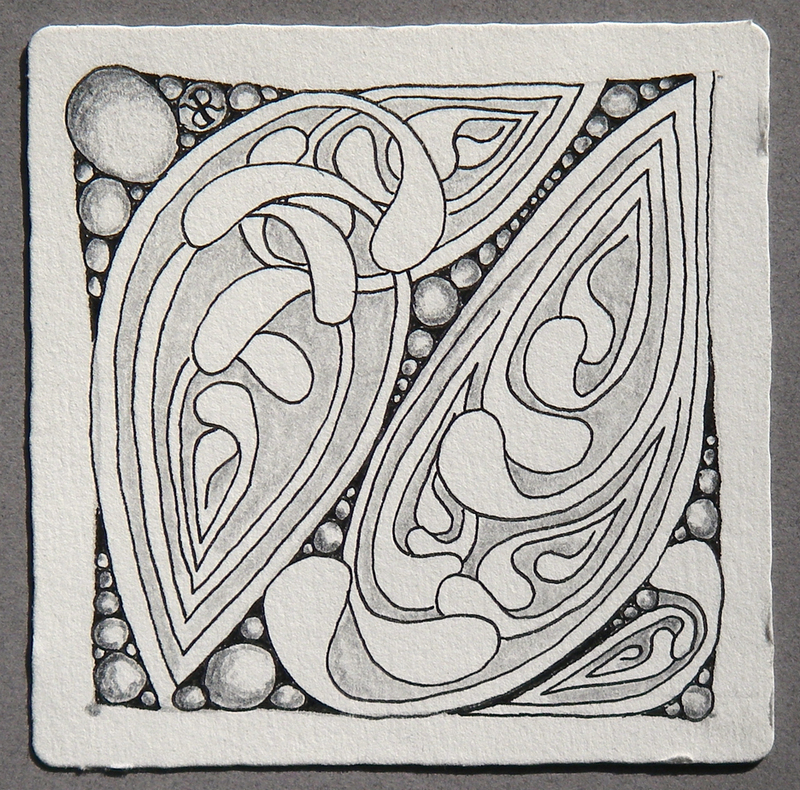 Challenge #19 from Laura Harms, CZT is "More Morris - Create a tile or Zentangle Inspired piece using the William Morris technique of light over dark." 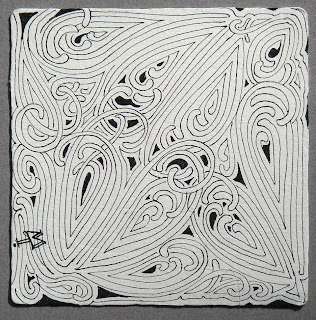 Last night we realized there is an unspoken aspect of Zentangle that has naturally flourished among tanglers worldwide . . . an absence of contests! We've not noticed any competitions and contests with their accompanying winners and losers, bests and worsts. 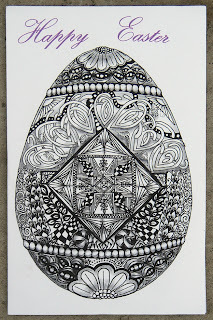 That makes sense, because Zentangle is none of that. 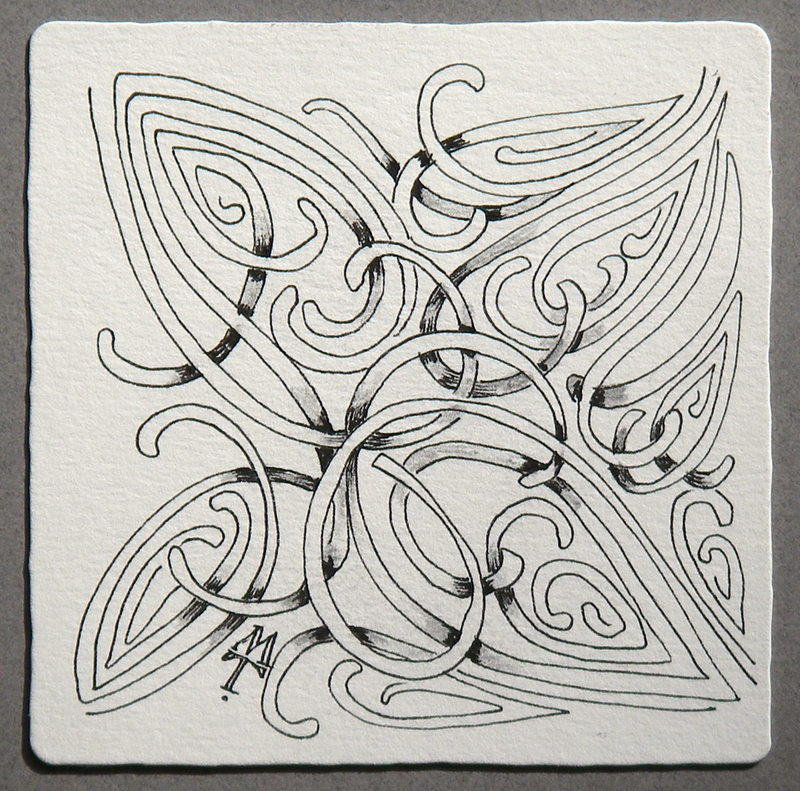 Zentangle is comfort, inspiration, gratitude, self-confidence, happiness, sharing, encouragement, satisfaction and empowerment. How cool is that! 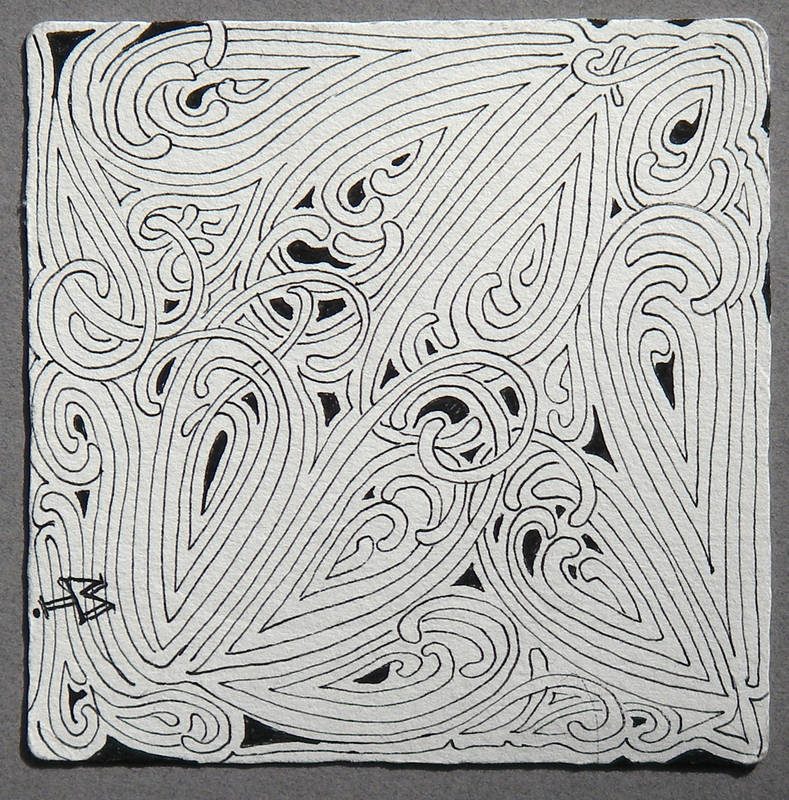 Thank you all for reflecting Zentangle's empowerment of process and beauty of result in such wonderfully individual and uplifting ways. Oo, Oo - Gotta Share! Molly just stopped by and showed us this . . . Thought you might enjoy it, too. Off now to add it to Laura Harms' Egg Challenge! We just added a link to our blogroll ("ScrawlEncompassing" to your right) for Jane Dickinson, CZT. 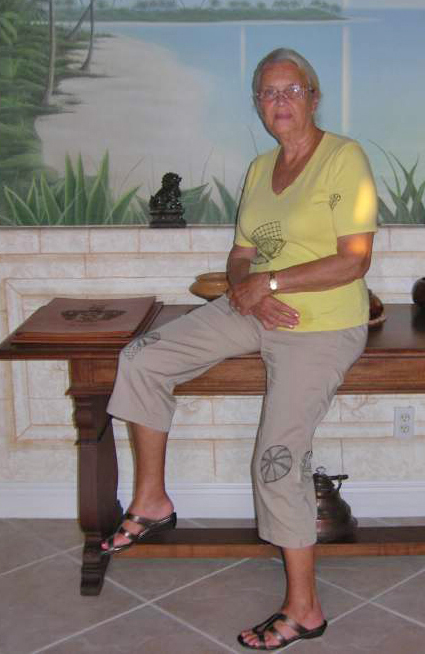 As I was doing that, Maria, who was sitting across from me on our porch, said, "You have to look at this!" It was (cue soundtrack from Twilight Zone) the same image I was viewing at that moment! 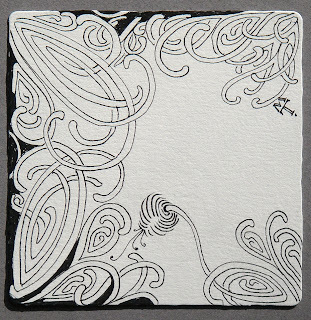 We were appreciating how, with just some shading where the lines were close together, Jane had created an image that looked like someone poking their fingers into it from the other side. Jane had created this for Laura Harms' 15 Minutes of Fame challenge. Which brings us to another "elegance," the . . .
For weeks and weeks I have enjoyed the energy and eye candy over at Laura Harms’s blog I am the Diva. 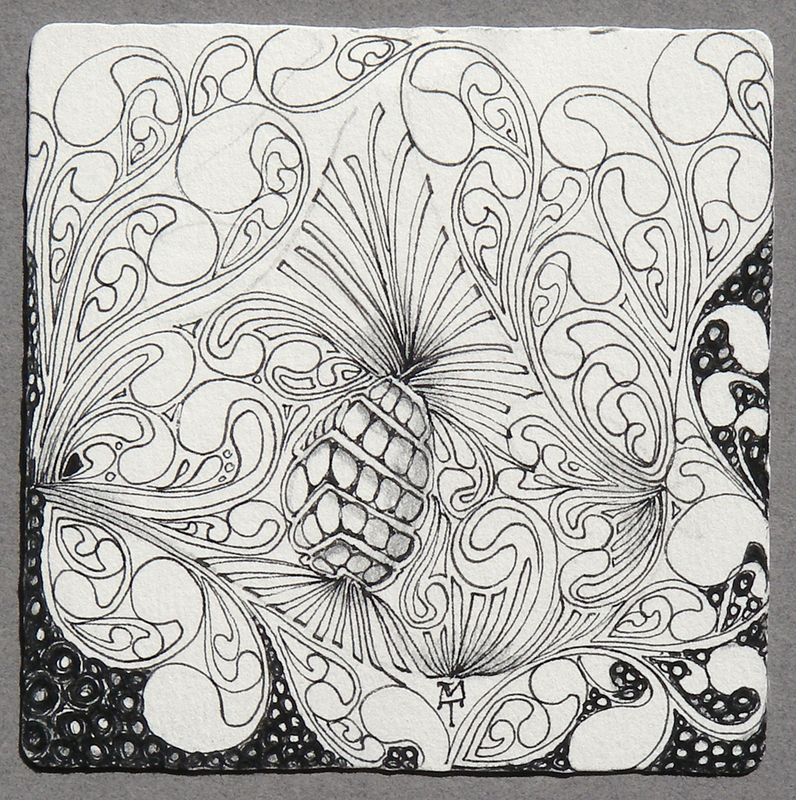 She is issuing a weekly challenge that has struck a very creative chord in many Zentangle® enthusiasts. The weekly slide shows Laura assembles are such a treat to sit back and absorb; so much fun to see the variety submitted on the same subject. So here is it, Challenge #17 and I have decided to join. 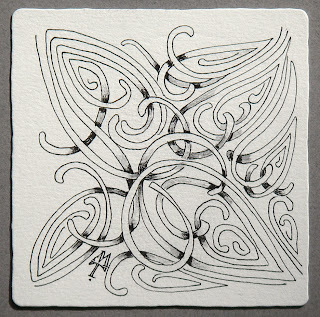 I chose this round in part because the requirement is to spend only 15 minutes drawing a Zentangle. I chose a single pattern for simplicity and time. My first version of Knightsbridge was simple enough to allow me to fill in all the squares in the allotted time. 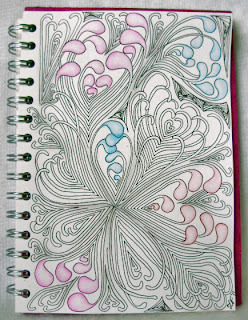 In this, my second attempt, I wanted to use the lines to further suggest shape and also allow myself time to shade. Once I had the lines drawn I realized I would *never* have enough time to color in all those little polygons! So out came the pencil for shading and I called it finished. 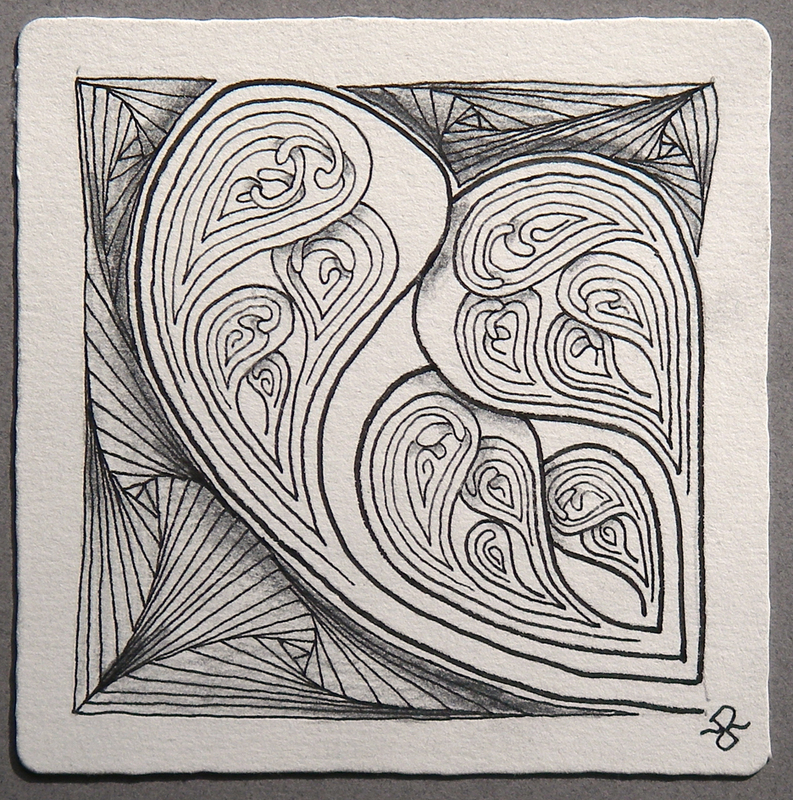 Given the limit of time, Jane created something that might not have otherwise have taken form. 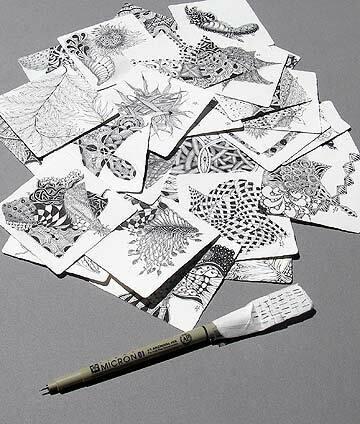 We think that is part of Zentangle's (and life's) magic . 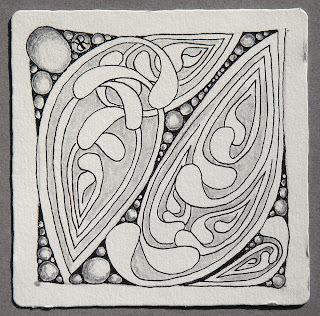 . . the elegance and inspiration of limits of tile area, of a Zentangle string, and of time. Two years ago I met a lovely artsy crafty lady. Her energy and enthusiasm learning new things started me on my own path. We shared ideas and encouraged each other while spending hours in our local park enjoying the outside and each other as our dogs played. A year ago our paths diverged and, although there were the occasional phone calls and email in the beginning it soon tapered off. It had been over six months since we last communicated. 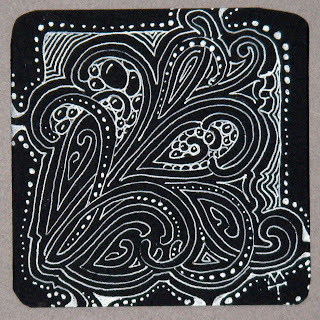 When I discovered Zentangle, I thought of her and how much she would enjoy it and planned to contact her soon. Before that, I wrote to you thanking you and you kindly posted my email on your site newsletter. And, because this is not a coincidental universe (!) my friend saw the email and knew right away that it was me! 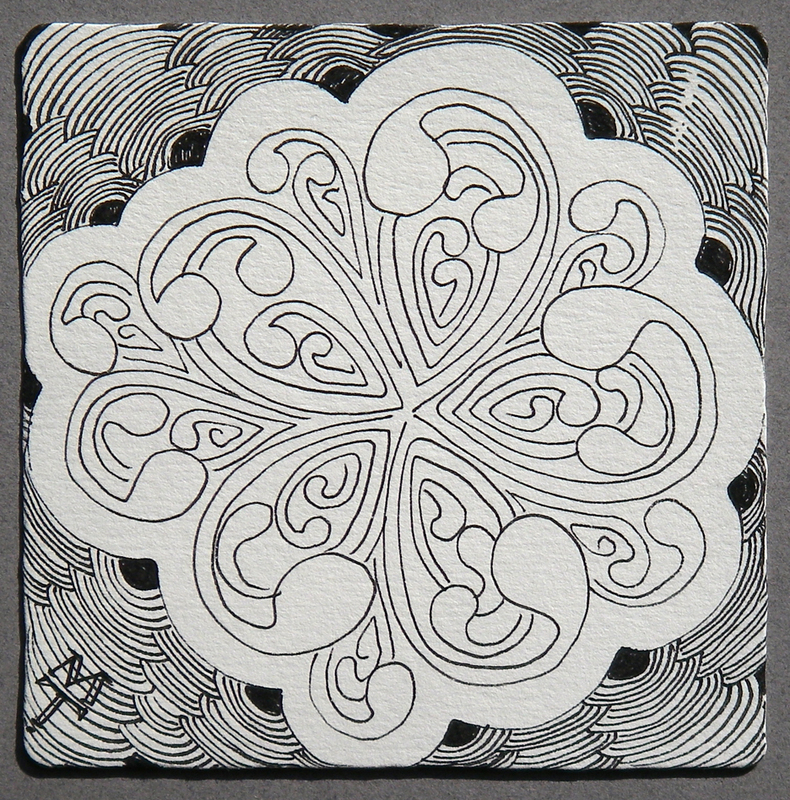 She called immediately; shared the news that she had found Zentangle at the same time I did! We chatted for nearly an hour! 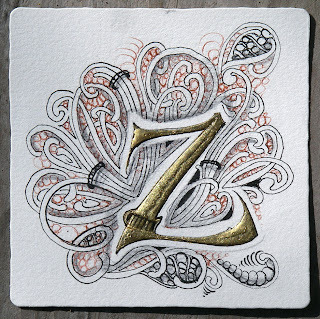 We will meet again in two weeks at the local stamping shop that hosts a Zentangle group! Thanks again for reuniting me with a long lost friend! 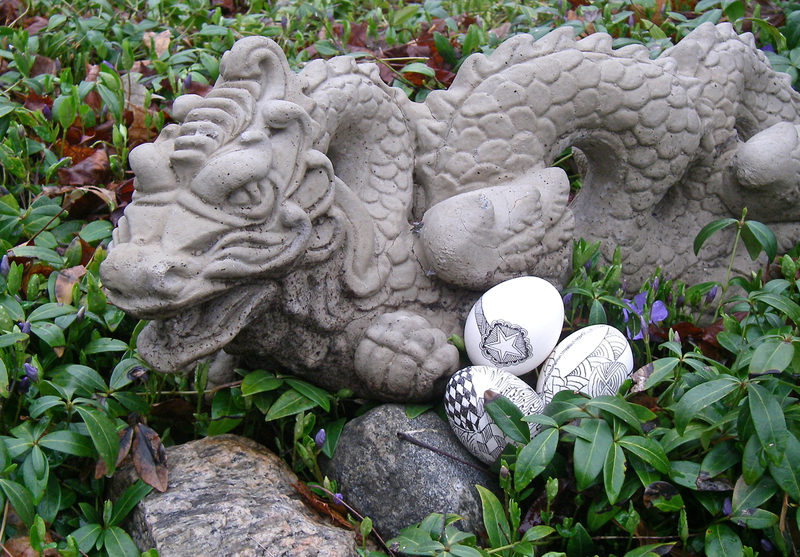 Challenge #18 from Laura Harms, CZT, is EGGZZZZellent! The first is my entry in the Diva's challenge #18. I wanted the egg to appear and disappear at the same time . . . just for fun. 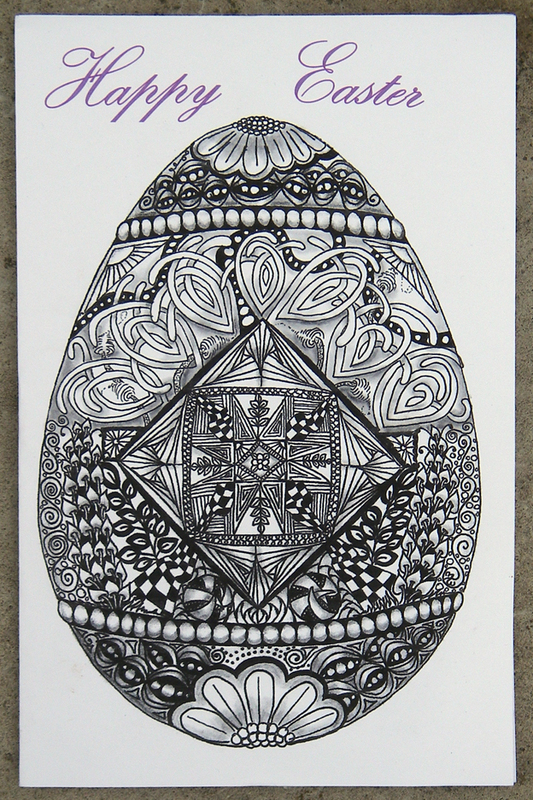 The background of the egg shape is done in the Wm Morris style we showed on our blog a few weeks ago. 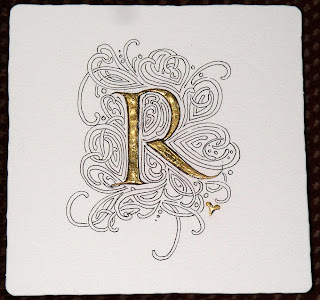 By blackening in the background, then going back in with a white Sakura Gelly Roll pen . 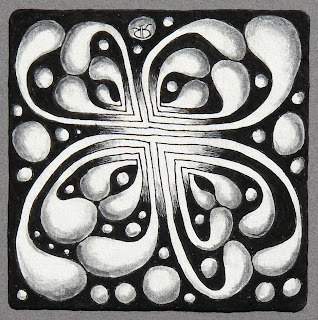 . . just filling in with delightful little deliberate dots of white to lighten the heaviness of the black, but really, because it's so much fun to do. 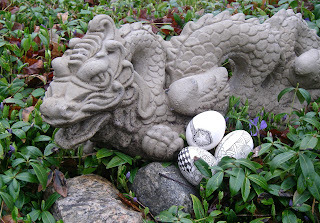 These real eggs were done a few years back by Molly, Jean Moroski, CZT, and me. We used Microns, but you must be careful not to smudge them as they take a while to dry (unlike the same pen on paper). We feel honored to have received this beautiful Easter Card in the mail yesterday from Mickey and Howard Weitsen, both CZTs from beautiful New Orleans. 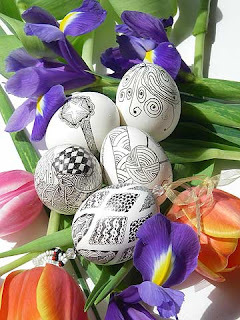 (Mickey drew the egg.) Thanks guys for sending this. 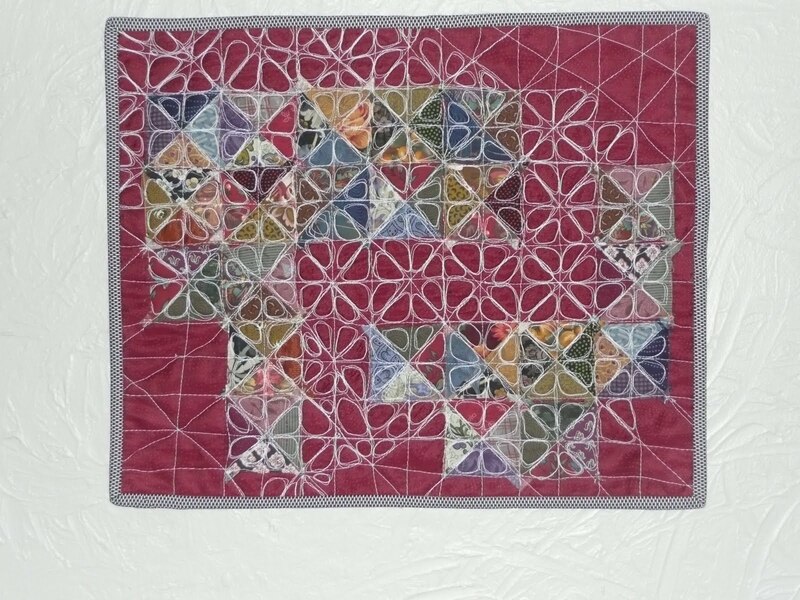 We received this quilted interpretation of n'zeppel recently. Just thought I’d take a moment and tell you how much I have enjoyed Tangling!!! I am a quilter by trade and had to turn a zentangle into a quilt. Attached you will find the photo. 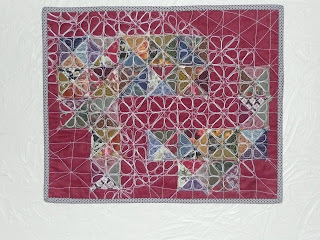 I took fabric scraps and made hourglass blocks, then adhered them to Duponi silk and then stitched the grid and the tangle. I can’t wait to make another next month – I plan to create one each month for a year. Thanks for hours of entertainment! 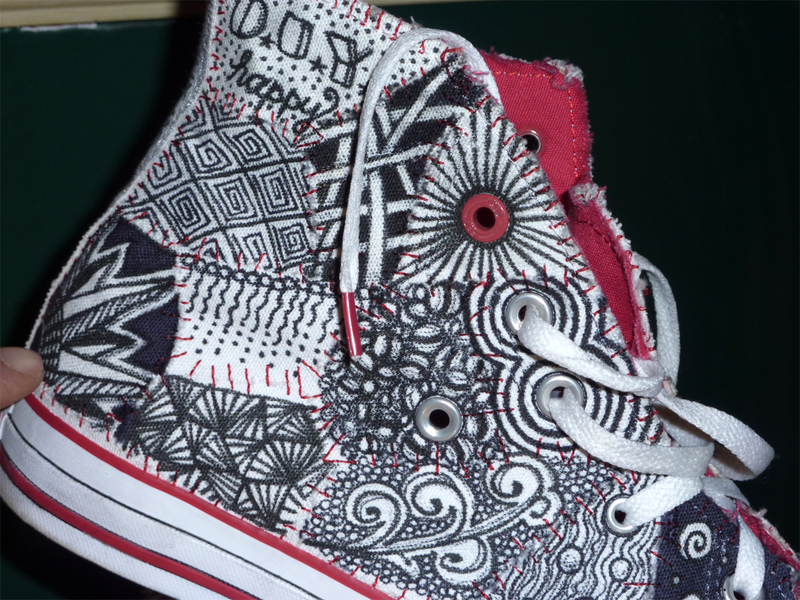 Beautiful work, Julia! A great interpretation of n'zeppel! Thank you for sending that. One reason I love this change in the weather is that I can take our blog pictures outside in the early morning sunlight. 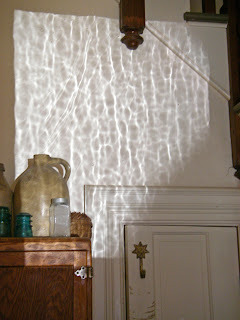 As I came back inside after taking this morning blog's picture, this is what I saw in our hallway . . . This morning's early sun was reflecting off Nancy's car windshield and through the old glass in our door. 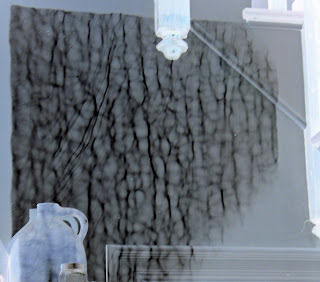 I marveled at its soft organic texture - a translation of bright light through brittle glass. Out of context you might think this was a negative image tree bark or leather or skin. 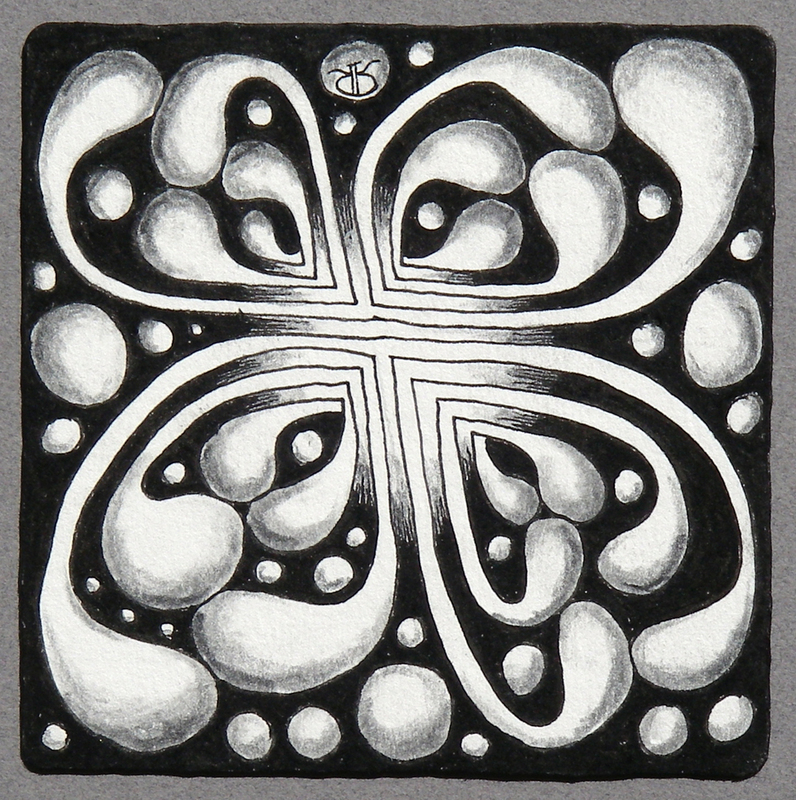 Before Zentangle, I might have thought that light in our hallway was neat, but I would not have spent moments marveling at its pattern - appreciating it - wondering if there was a way to deconstruct it into a tangle. I doubt that I would have ever noticed the similarities of patterns and textures. 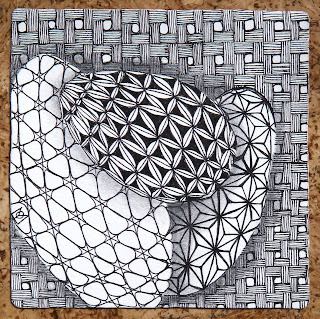 An important side-effect of practicing Zentangle is an increased awareness and appreciation of our environment - a world of beauty and mystery that we might not have noticed and appreciated in the same way before. 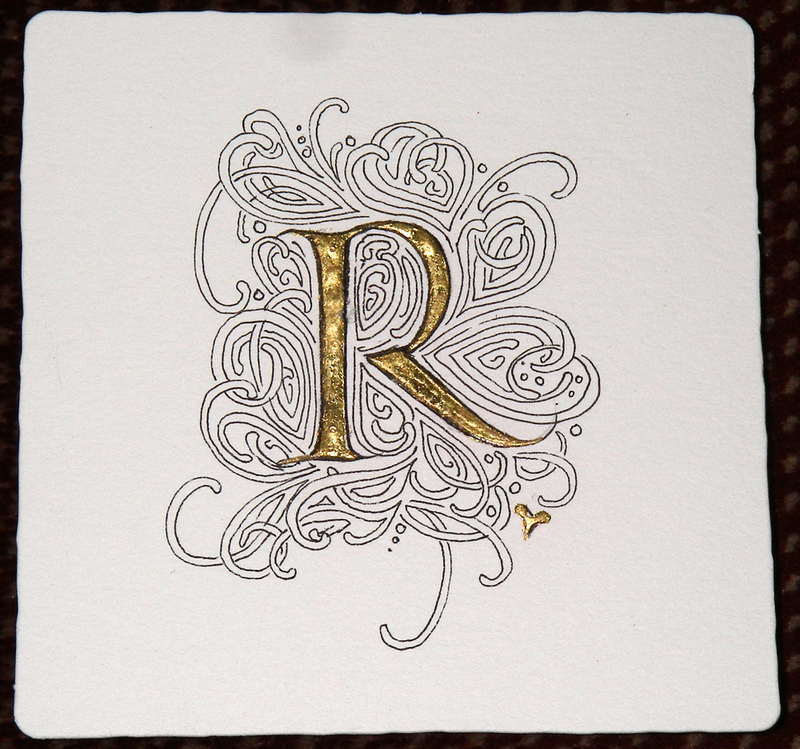 Maria continues to practice her gilding technique. 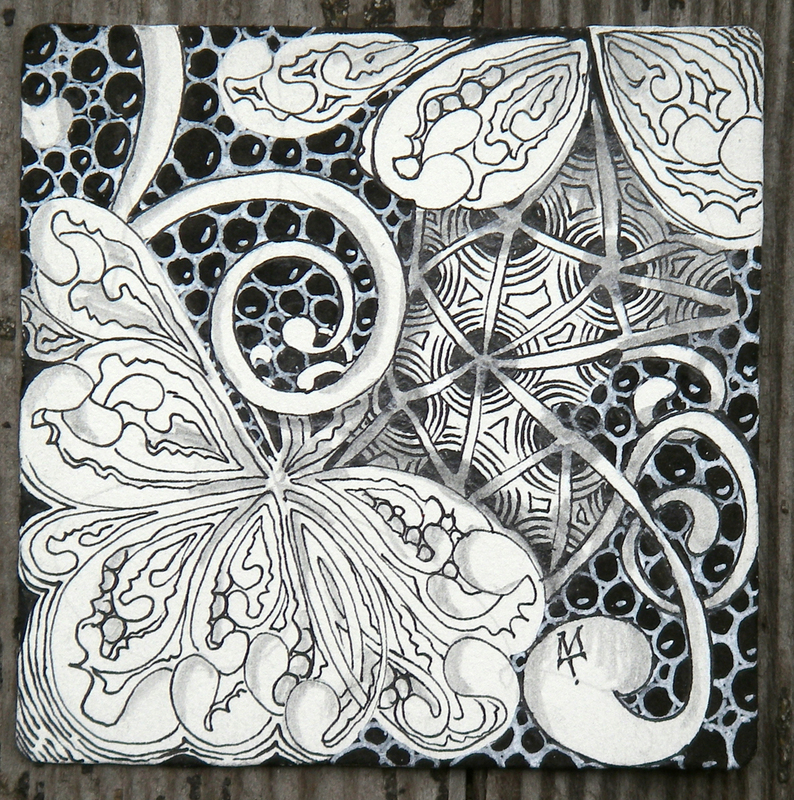 She has been using Zentangle tiles both for their convenience and because they are made of the same paper she uses for her large scrolls and presentation pieces. 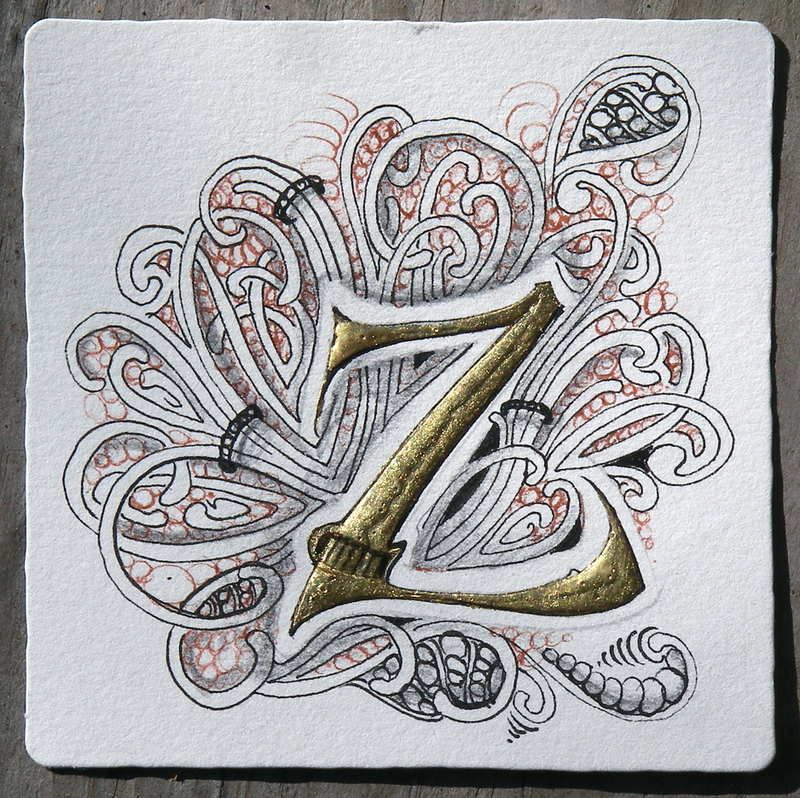 As she was laying down the sizing for this "Z" it smeared. (Notice the bulge to the left towards the bottom of the angled vertical.) She couldn't remove it without ruining the paper. So she went ahead and guilded everything and then she "fixed" it with a banding effect. Notice how Maria's mooka interacts with this Z by aura-ing in a hollibaugh (always behind) fashion. 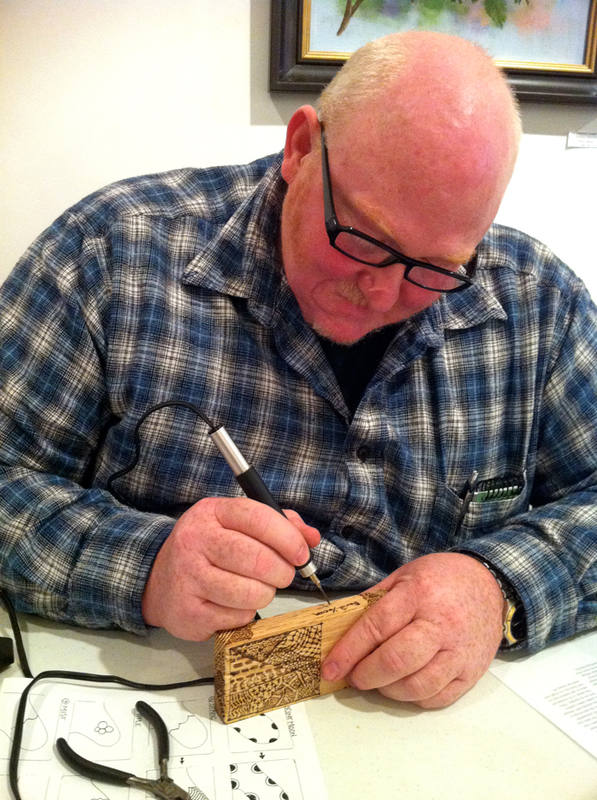 We started to wonder about some of those fanciful and unexpected embellishments you see in old manuscripts. Maybe they weren't all that intentional after all. So let's remember to allow for those "oops" and our opportunity to turn them into "oopertunities"! 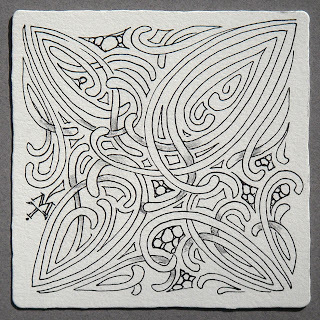 There's no eraser in a Zentangle Kit. There's also no eraser for unbleaching laundry. However, there is a solution. 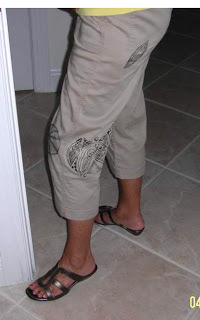 Zentangle's solution to Clorox damage on some favorite clothing. Please feel free to use the pix, actually I would be honored! I absolutely LOVE Zentangle and am so inspired by your newsletters, it has opened a whole new area of art for me. Thanks Lena for reminding us that even though you can't undo or erase something, you can often use it as an inspiration for something even more wonderful. This blog entry begins with Maria's contribution to Laura Harms' weekly Challenge #17. 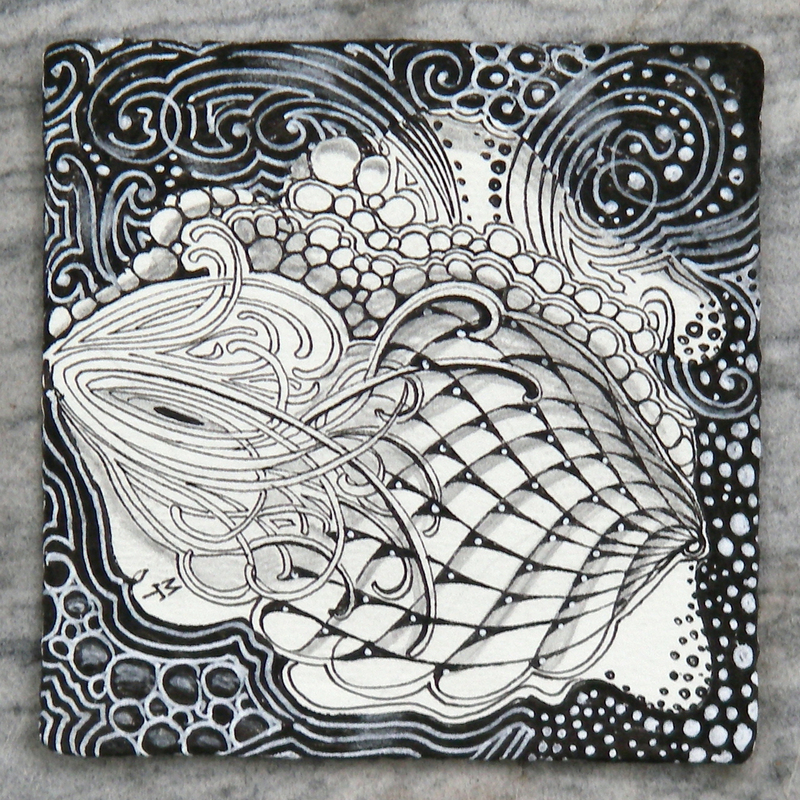 This week's challenge is "15 Minutes of Fame" -- complete a Zentangle tile in 15 minutes. When we were first designing Zentangle, one of our choices was how large to make a Zentangle tile. 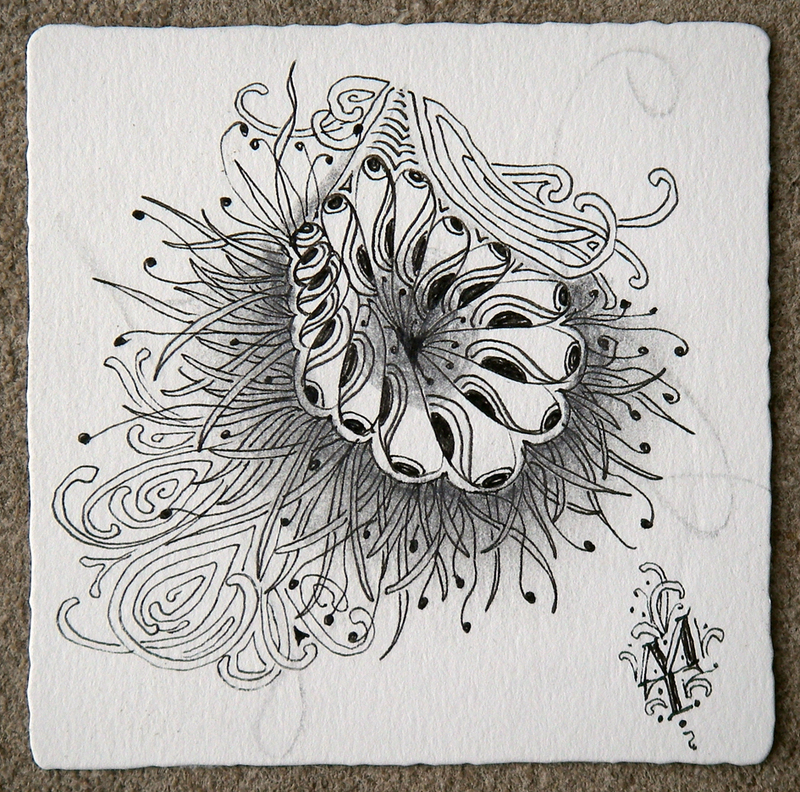 One reason we chose a 3-1/2 inch (89 mm) square tile was you could complete one that size in about 15 minutes. Recently someone asked us, "How long does one of those pens last?" 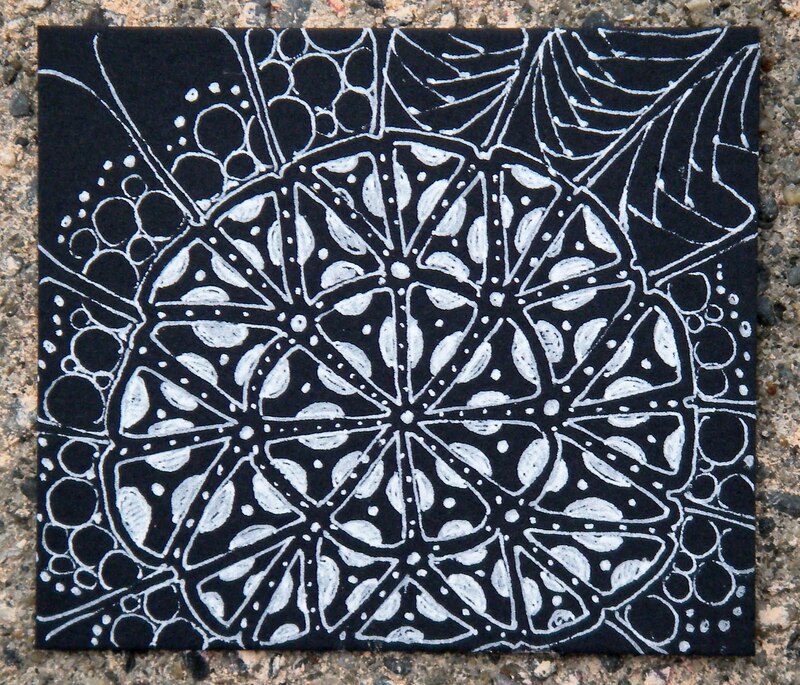 (We use Sakura's Pigma Micron black 01 pens in our Zentangle Kits.) We looked for the same pen we had used for an earlier test. 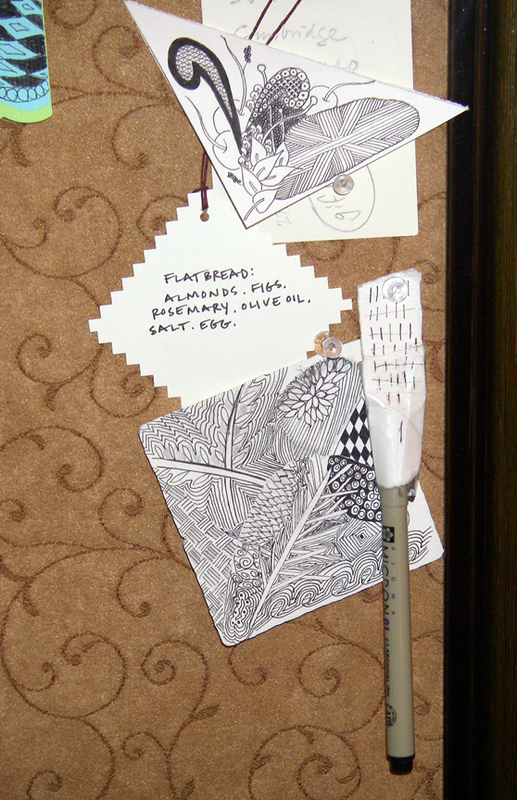 We found it hanging vertically on our bulletin board. (You should always store these pens horizontally for best performance.) Maria used that same pen to create today's tile. We went to our newsletter archive page to find out when we had done our test. We had done it 34 months ago! You can read about it in our June 2008 newsletter (which also has some great pictures from our "Backstares Gallery" and a cool tangle). 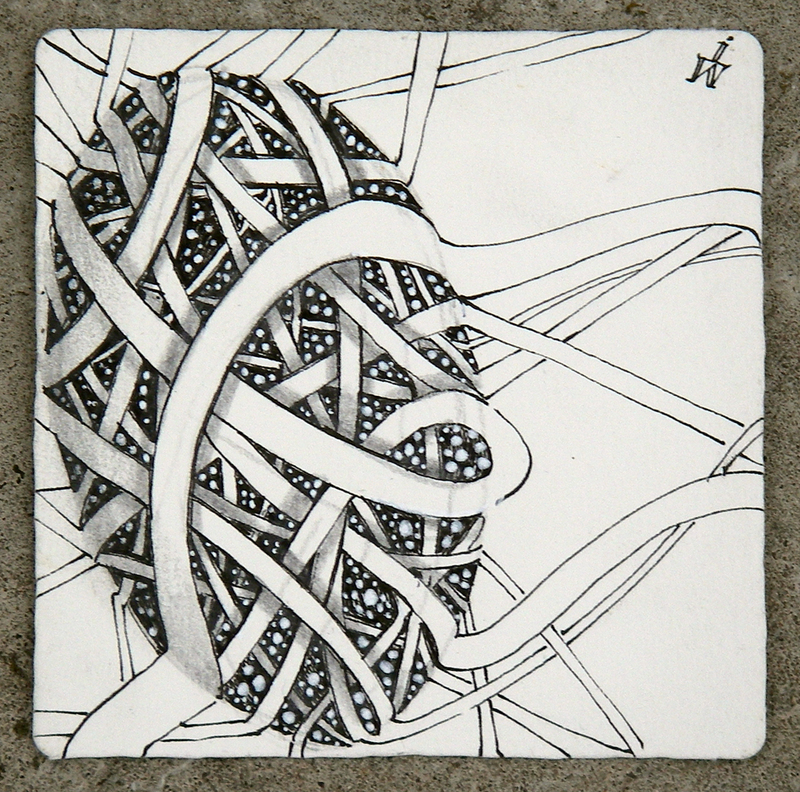 Here's a picture of some tiles from that pen. 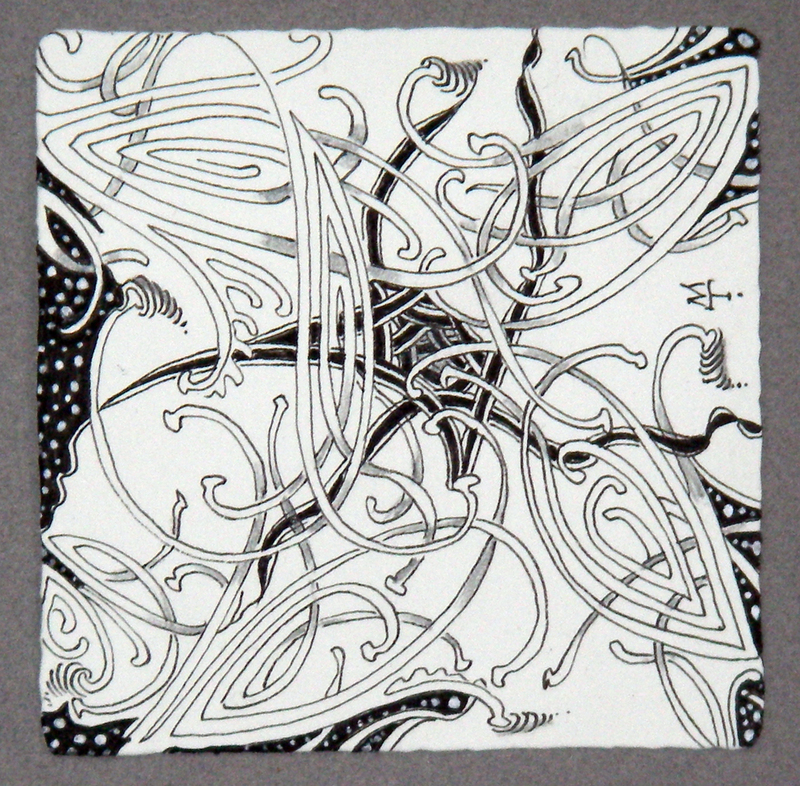 Today's Zentangle is the 33rd Zentangle created with this pen. This is after that pen was stored for 34 months. Not bad! Maria noted that its line was finer -- more like an 005. But it still had fun enjoying its 15 minutes of fame! 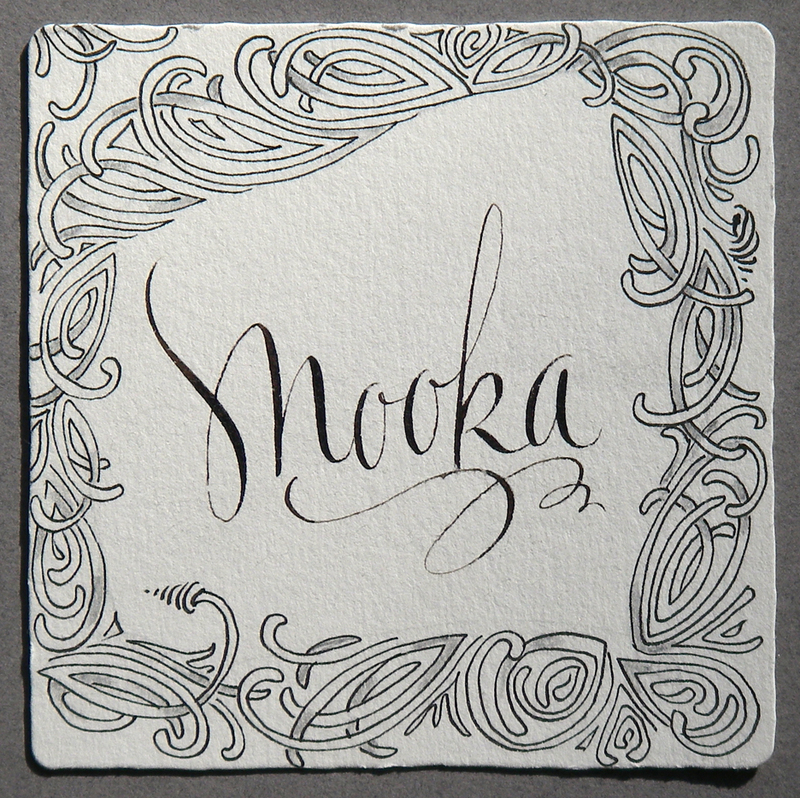 In our recent mooka YouTube, we said we were looking forward to seeing your mooka creations. 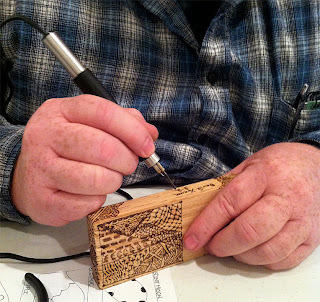 Well, with the help of Laura Harms' weekly challenge, we've been able to do just that! If you haven't seen it already, please take a moment and click through to Laura's slide show. This is the most beautiful, not to mention BIGGEST, slideshow to date... i spent a good chunk of last night visiting everyone's blogs and gathering images... as late i laid my head to rest last night, visions of Mookas danced in my head. i kid you not. What a lovely dream. You can also go to picassa's mosaic page of these slideshow images. 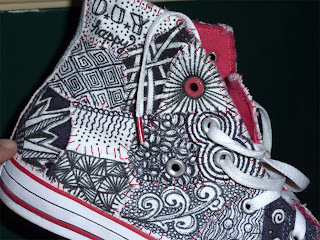 There you can click on individual mooka Zentangles and Zentangle creations to see them at full size . . . like this one. Our gratitude goes out to Laura and everyone who contributed. Thank you! 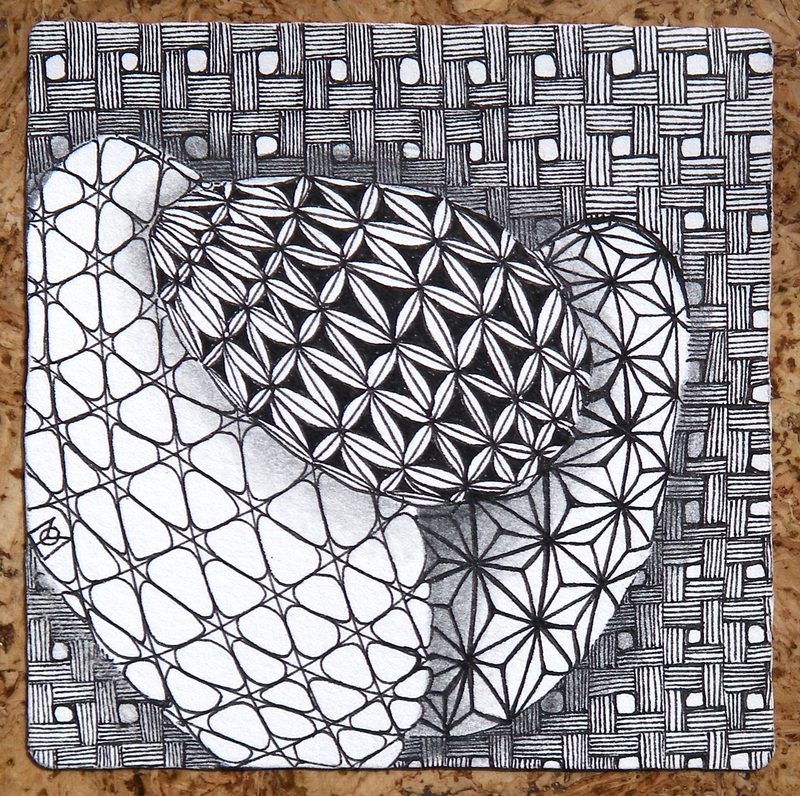 As an avid reader (and sometimes commenter) of your Blog, I have long been inspired by the projects that others have shared highlighting their ZIAs (Zentangle Inspired Artworks). Although this is not a 'new' project, they have garnered enough commentary on their occasional outings for me to think that you guys might like to check them out, too! I know that these are not the first shoes to come your way; but *of course* I am rather fond of them; and very tickled with how they turned out ;-) They have been generously sealed with Scotch-Guard, and have not suffered in the few wet weather days that they lifted my spirits with wearing. 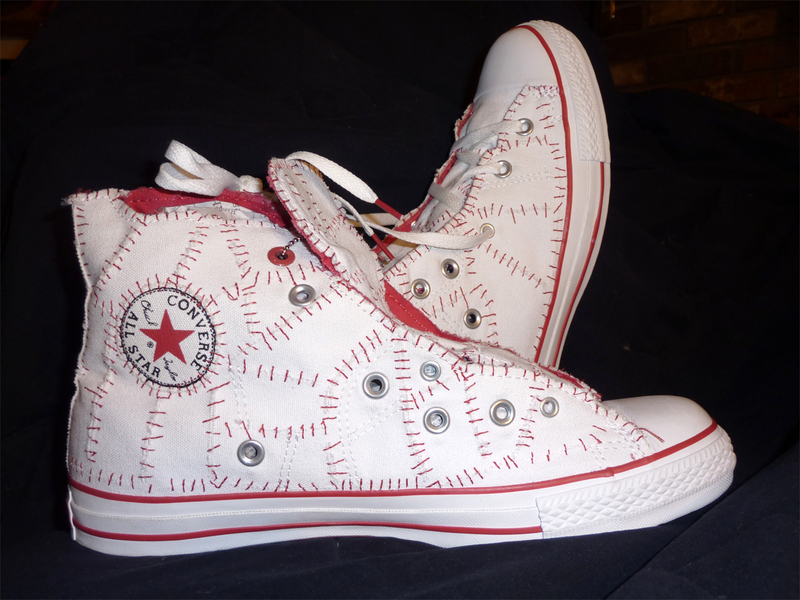 I was initially inspired to create a pair of Zen Sneaks when I discovered that Utrecht now offers the quintessential 'blank canvas' for feet: Primed Canvas Converse All-Stars! However, being the bargain conscious girl that I am, I opted for a more wallet friendly, and at the same time - UNIQUE, canvas for my inspiration. I found a pair of limited edition Chuck's for half the price, and proceeded to make them my own. These were part of a limited edition, artists series to promote the Product (RED) campaign to end AIDS. 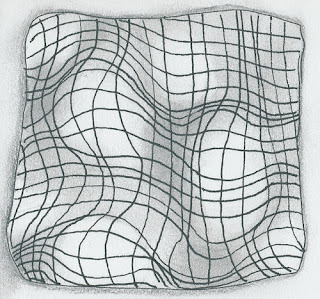 The 'broken' surface, created by the patchwork sections screamed to be tangled! 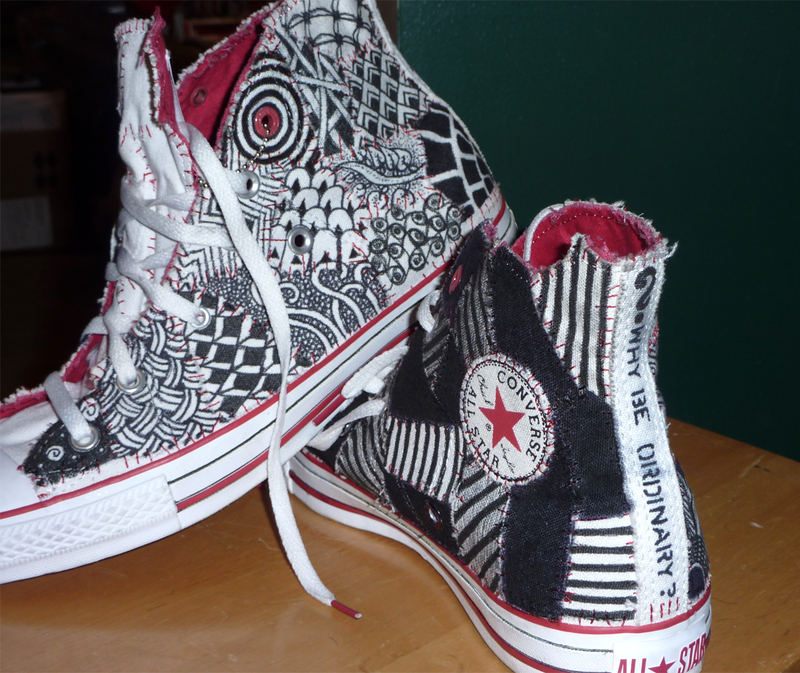 Nice shoes! We love how you took advantage of their "pre-strung-ness." 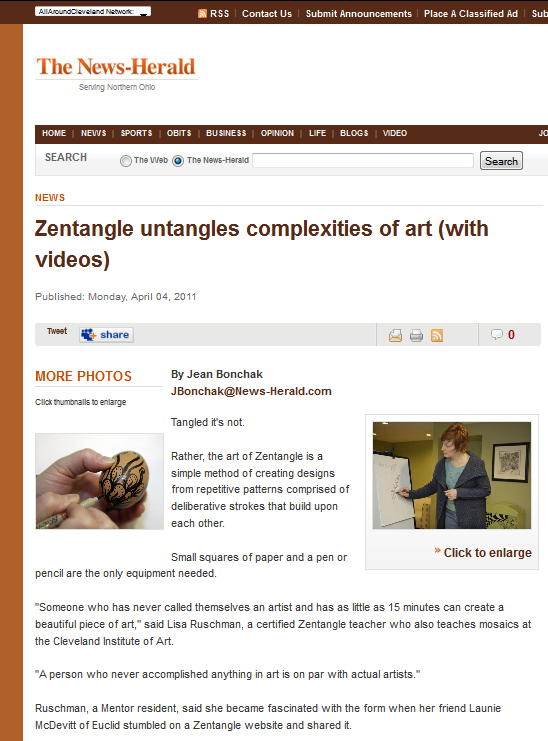 Lisa Ruschman, CZT in Ohio, sent us this link to a great article on her Zentangle classes. Take a moment to check it out. It's short, well-written and includes a couple videos. Laura Harms, CZT, aka The Diva celebrates her 16th Challenge with mooka. How exciting it is to watch everyone's mooka moments! We enjoy watching these wonderful tangleations appear . 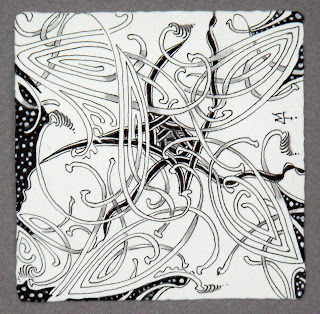 . . and other tangles that are emerging from this "pod" approach. Thanks, Diva, for this fun forum! Since we're on a mooka theme here, I have to share two more examples with you. 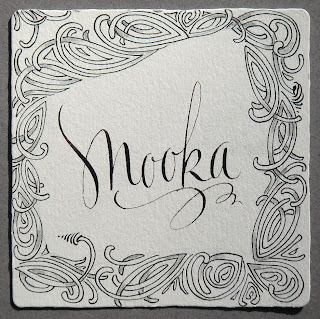 Learn more about mooka at this newsletter, blog entry and YouTube. 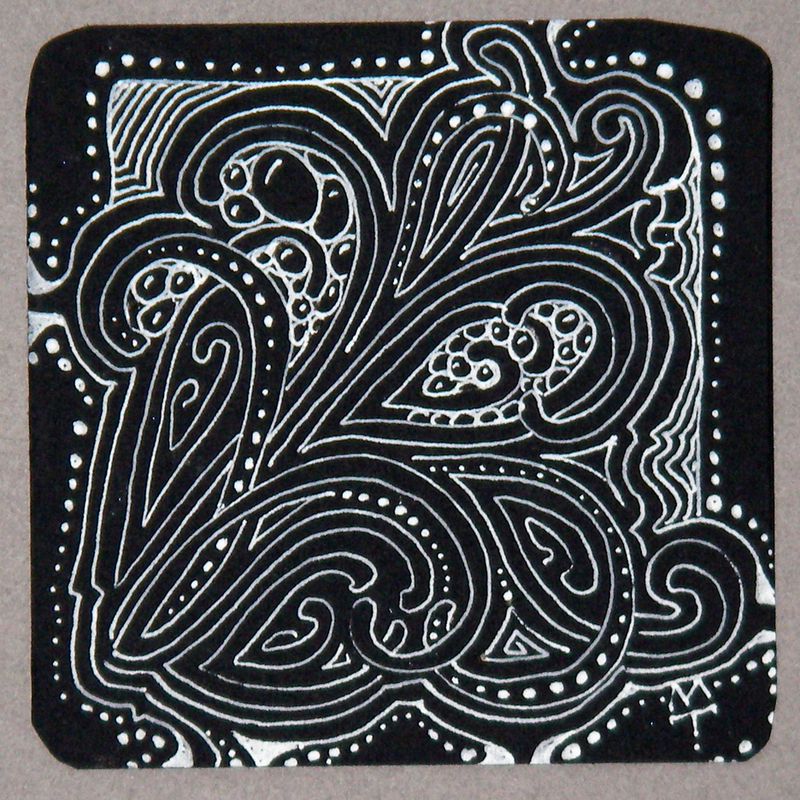 Last night I did a Zentangle Class at the Zanesville Appalachian Arts Project Gallery in Ohio. As I was handing out kits, one gentleman told me that he didn't need a kit -- that he was going to use wood! So he set up his equipment and followed along in the class. At the end of the class, he gave me his finished piece, which is delightfully done on a block of oak about 2 1/2 x 4 inches. 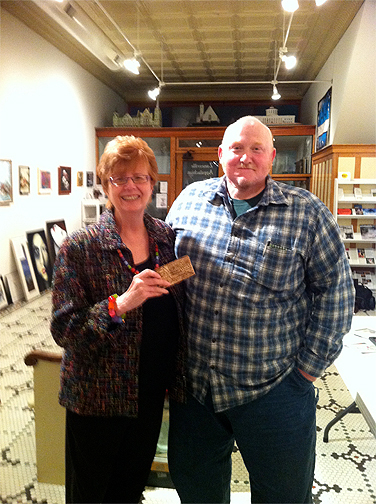 His name is David G. Yocum, and the oak was a left over piece from a gorgeous wooden cabinet that was on display in the gallery. 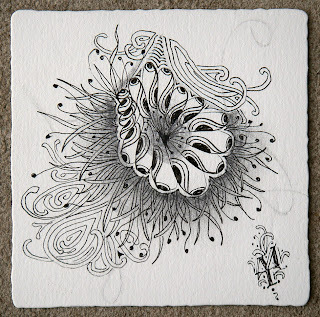 As you can imagine, I now have a most treasured gift of a very unusual piece of Zentangle inspired art! Thank you Carol. Thank you David. Awesome! We look forward to seeing what's next. Images and attribution by permission. 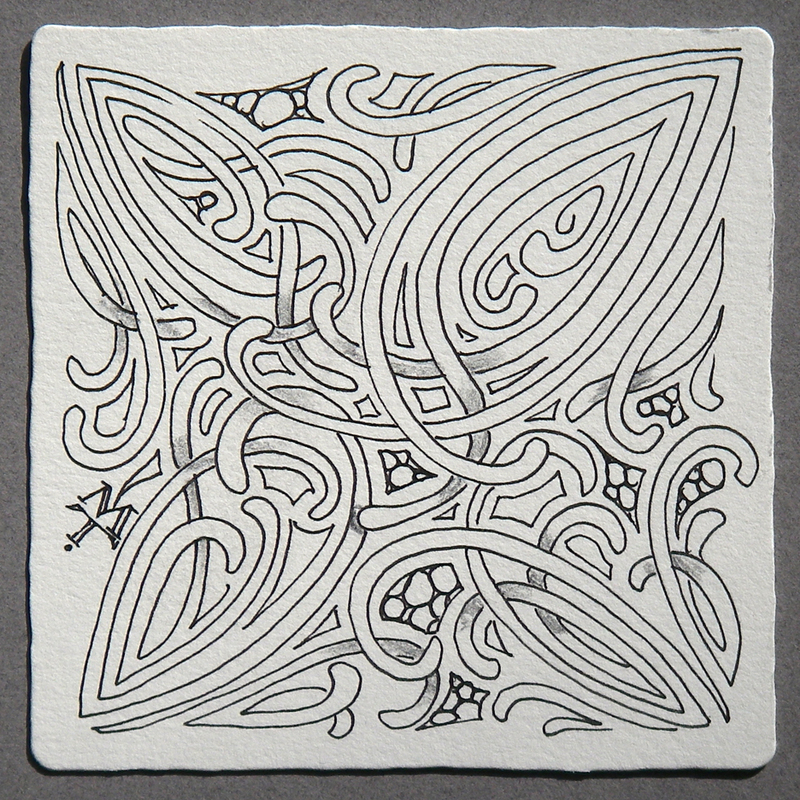 We are excited to share a new tangle that we have been working on. It's called mooka. Read more about it and view written directions at this newsletter. We created this YouTube for mooka. Below are some larger images of tiles used in this YouTube. 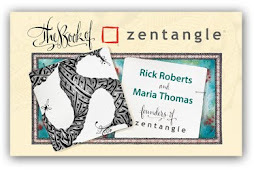 We are excited to see what you create with this dynamic new tangle. 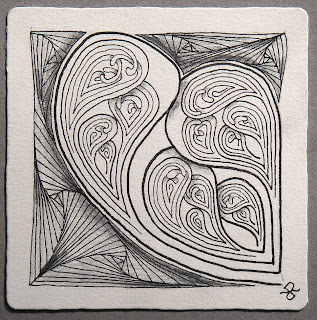 My love of curved lines is obvious in my work, be it nudes, calligraphy, or Zentangle. Even my straight lines are somewhat curvy due to giving up rulers for Lent (and permanently misplacing them). I feel it to be a wonderful complement to Rick's tendency to do things straight, true and plumb . . . in a-line-ment. I'm glad our porch floor isn't curvy. Life is good and wonderfully balanced. 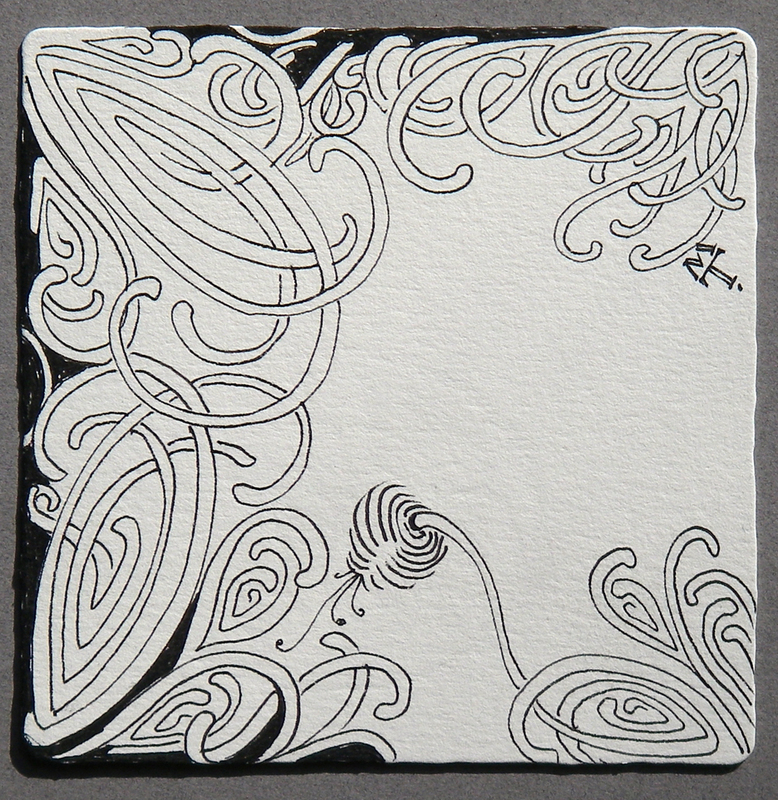 Expanding on our previous Wm Morris post, here's my contribution to CZT Laura Harms' Challenge #15: "Love Your Curves, Baby."